A traditional hot toddy is a soothing drink made from whiskey, hot water, honey, lemon, and cinnamon. Since it’s served hot — often before bed (the whiskey will knock you out! 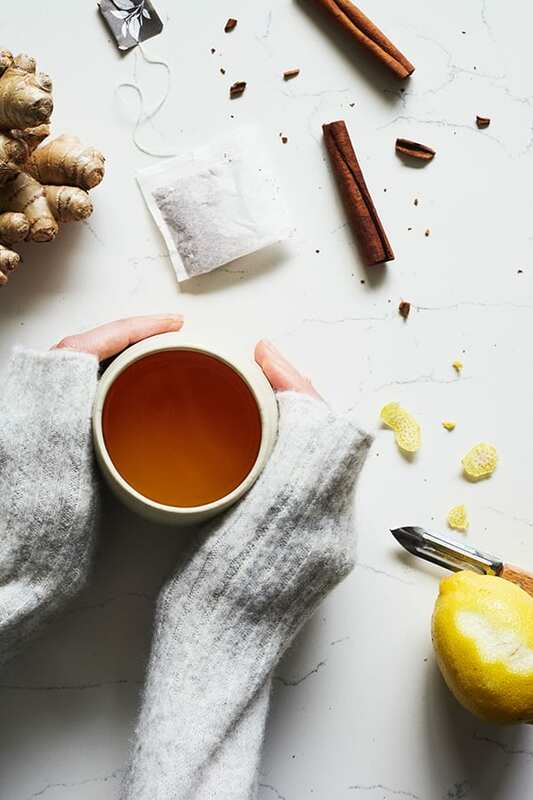 ), after a day in the spent frolicking in the snow, or as folk remedy for a cold or cough — it’s especially popular in winter, and perfect for the holidays. 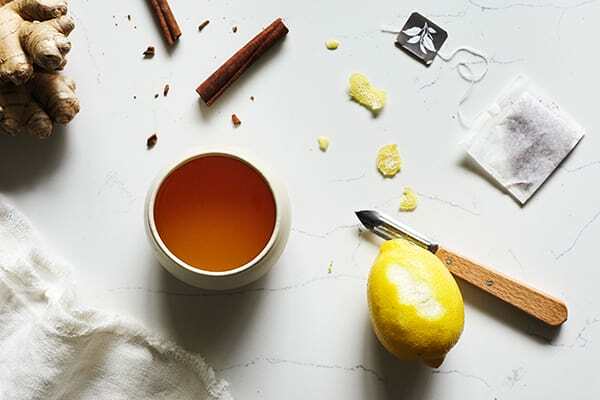 This family-friendly rendition of a hot toddy recipe is made on the stovetop and is meant to be served warm. The rooibos tea simulates the color and flavor of whiskey, while keeping it non-alcoholic — but hey, if the adults want to add a splash of whiskey or bourbon… we’re not going to stop you. The natural sweetness comes from apple cider (or apple juice), which is then spiced with lemon, cinnamon, and fresh ginger. For a spicy kick, add a pinch ground cayenne pepper, and to make it a bit sweeter add a teaspoon or two of honey or maple syrup. At home, my family loves this hot toddy recipe so much that we make a giant batch on the weekend. Once the tea is fully steeped, I strain the liquid into jars and store them in the fridge. That way, when company comes over, it’s quick to simply reheat on the stove. For other festive drink recipes, check out these drink ideas including Candy Cane Cocoa Latte and Lower Sugar Apple Cider. Place apple cider, water, lemon juice, lemon peel, cinnamon, ginger, and salt in small saucepan. Bring to a boil over medium-high heat. Turn off heat. Add tea bags. Let steep for 10 to 15 minutes. Remove tea bags; serve immediately.